I’ve been less than active on the blogosphere as of late, not because I haven’t been baking, but simply because I haven’t baked anything noteworthy.. other than several banana cakes for which I’ve already posted the recipe (here). I had a real hankering for all things lemony all throughout January, and tried several different lemon and coconut cookie recipes (one with toasted coconut and white chocolate which had a lovely flavour, but lacked the crunchy-chewy texture I was after), but was left slightly ‘meh’ every time, it was really frustrating! So I went back to my trustee old banana cake, which never disappoints me. I’ve recently discovered that it’s even better if you microwave it for 20-30 seconds before eating, as the chocolate melts and it’s just like eating it fresh out of the oven, gooey chocolate streaks and crunchy bits of walnut. It’s really one of my favourite cakes ever. 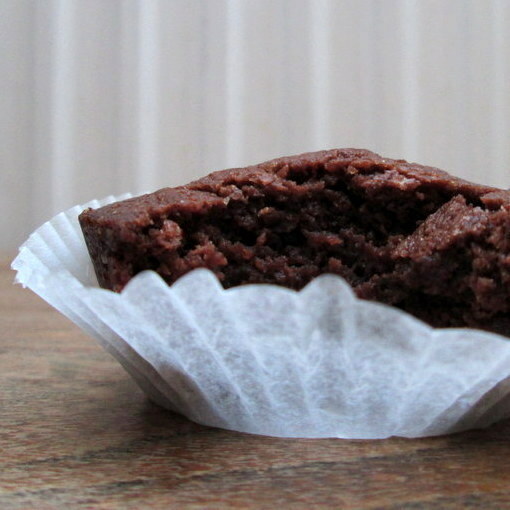 But I thought it was time to try something ‘new’, and by new I mean a new recipe for an old faithful, namely a brownie. I already have a favourite brownie recipe, but this one uses unsweetened chocolate, and I like my brownies seriously dark, not too too sweet, and fudgy and chewy at the same time (NOT cakey). Since Deb’s (of smitten kitchen) recipes have yet to fail me, I went for this here recipe. To maximise chewiness, I decided to opt for individual-sized brownies. They take minutes to stir together and pop into the oven, and the smell in my apartment as they were baking alone would be enough to make me bake them again. They yielded a frustrating 11 in a 12-hole cupcake pan, but never mind. Next time I’m doubling the recipe anyways. 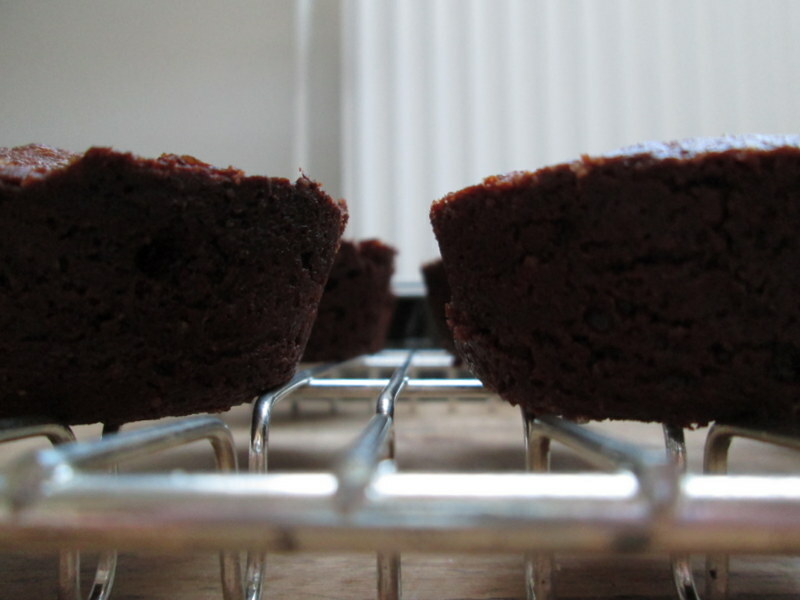 Grease (liberally, to help the brownies come out after baking) 11 holes in a 12-hole cupcake tin. 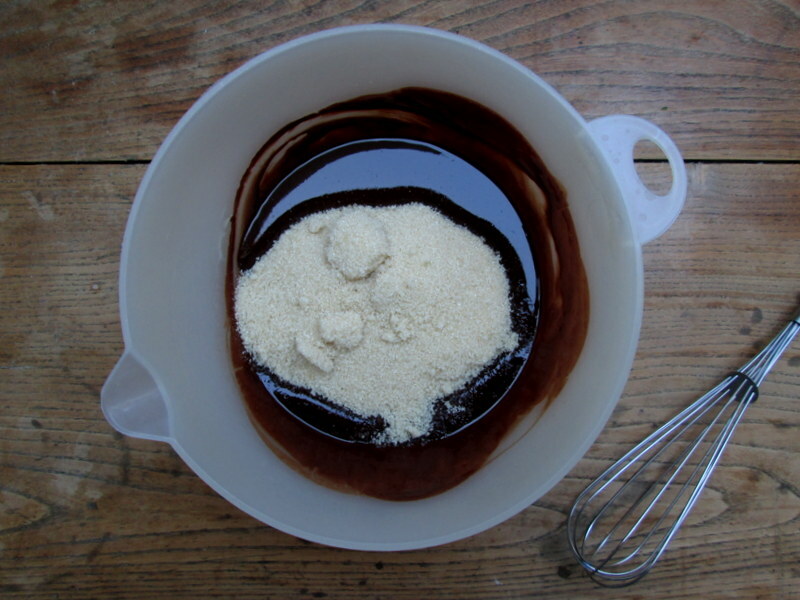 Melt the butter and chocolate together (either in a bain marie or in the microwave for 30 seconds to a minute, just until all the butter and some of the chocolate is melted, then taking it off the heat and stirring until the rest of the chocolate is fully melted). Whisk in the sugar, then the eggs one at a time. Add the vanilla and the salt, then fold in the flour with a spatula. Scoop into the cupcake tin (I used an ice cream scoop), even out a bit with a teaspoon, then bake for 15-20 minutes (I baked mine for 20), until a toothpick comes out clean. P.s. : According to Deb the brownies freeze well! 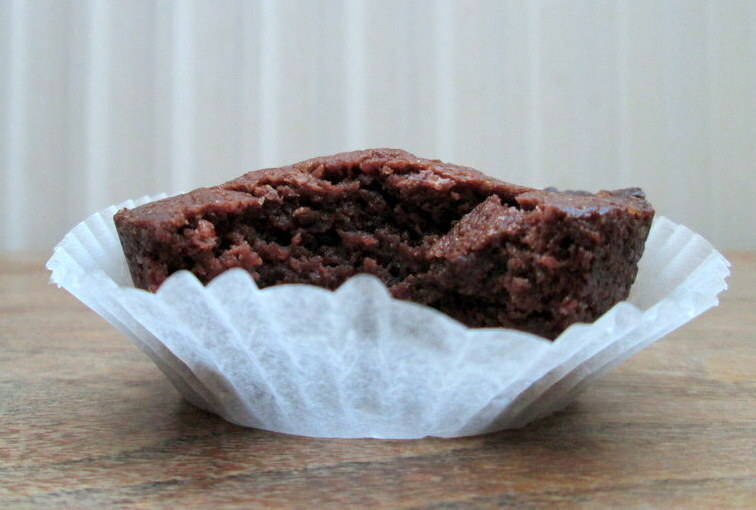 The brownies can also be baked in a 8×8 inches/20×20 cm pan lined with baking parchment (in this case bake the brownies for 25-30 minutes, then cut into squares once they’ve cooled), or in a mini muffin tin (bake for 16 minutes, yield: 29). P.p.s. 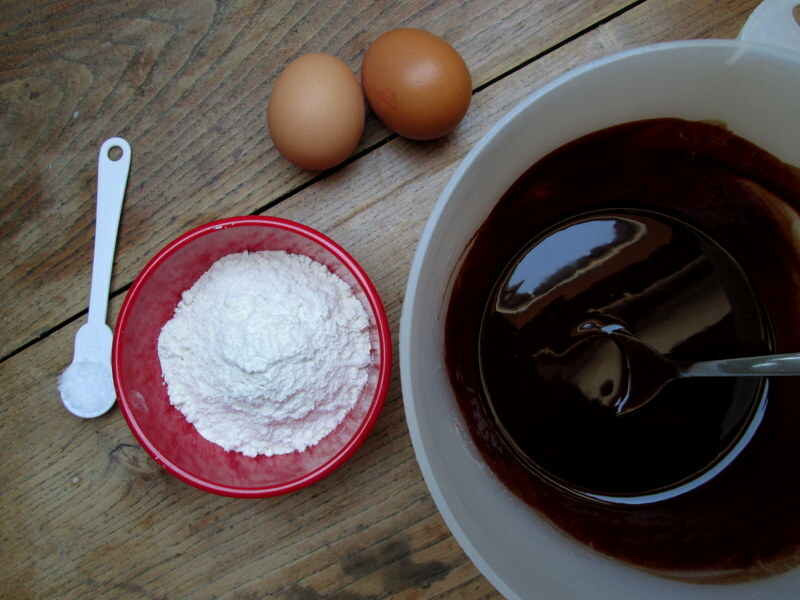 : I have since tried this recipe with 70% dark chocolate, because that was all I had in the house! I lowered the sugar dosage to 215 g, and added 15 g unsweetened cocoa powder when adding the flour. And I think they turned out great! Also, I managed to eke out 12 brownies from the portion of batter, and it was completely fine, and I’ve also doubled the recipe with great success! 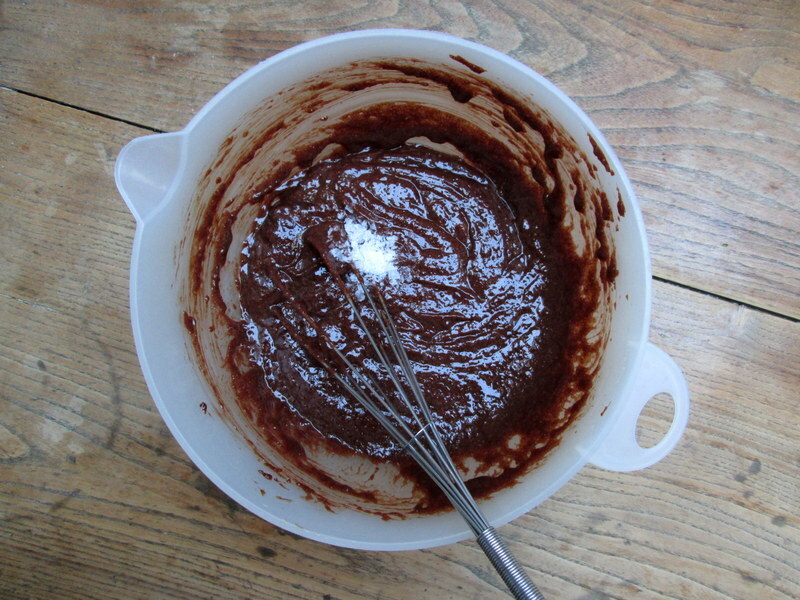 You can also pour the batter directly into liners, and although some of the brownie will stick to the liner, it’ll be completely fine and much easier than getting the brownies out of the tin/placing them in cupcake liners after baking (especially if you’re making a big batch).